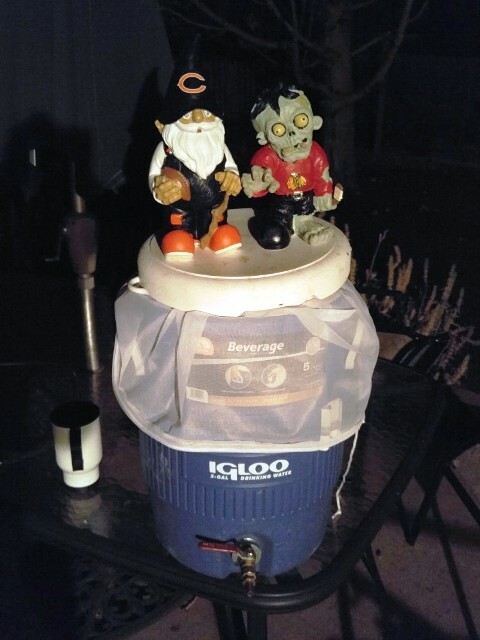 So, I had designed a couple of medium-sized (4 gallon) batches of beer to brew this weekend. 1) Base Lovin' American Wheat ... Just the grain, hops, water, and yeast of my Apricot Lovin' recipe. This should be perfect for blending with the Apricot Wheat or even just drinking on its own when we just want a simple wheat beer to drink. 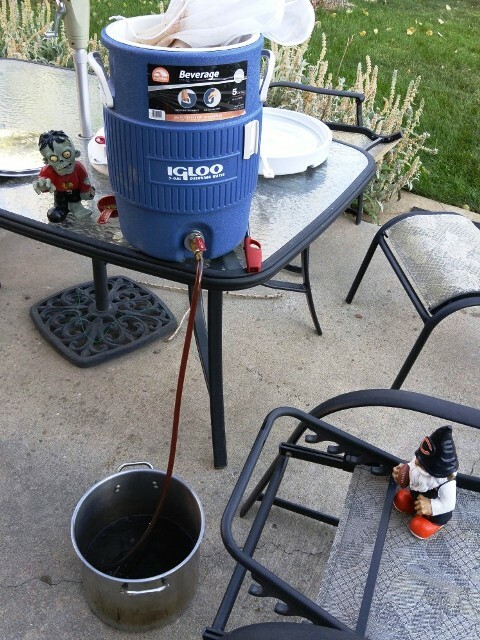 2) Gnaughty Gnome Apricot Cocoa Stout ... 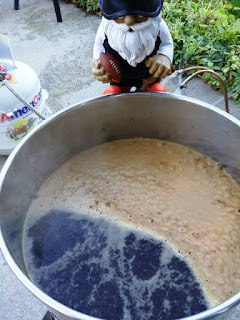 Very close to the Gnaughty Gnome English Coffee Stout recipe, but also includes some cocoa and some apricot extract. This will be something I can keep in bottles for awhile, and of course used up the Apricot Extract I wanted to get rid of. Not sure how much Apricot flavoring will come through with the roasted grains and cocoa, but this makes it an experiment too. I actually started the brew day on Saturday, mashing the grains for Base Lovin' late in the evening and letting the mash go through the night. I also prepared the water with the chalk addition for the Gnaughty mash. Because these were smaller batches at low gravities, I used my smaller mash tun. 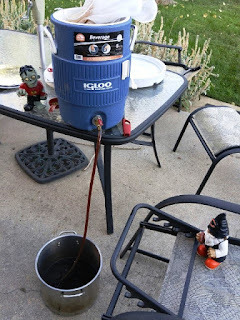 I got up early the next day and heated up some sparge water. I collected wort from the wheat beer. I wished I had the pot that my Gnaughty mash water was in (or had one more pot to use), but I ended up pouring the strike water for Gnaughty into my bigger mash tun. This meant I had to reheat that strike water, but that was ok. I got the boil started for the wheat and then cleaned out the mash tun started the mash for Gnaughty. Once the Base Lovin' boil was done, I cooled it down and then racked into the fermentor, which I put into an ice bath to further cool. 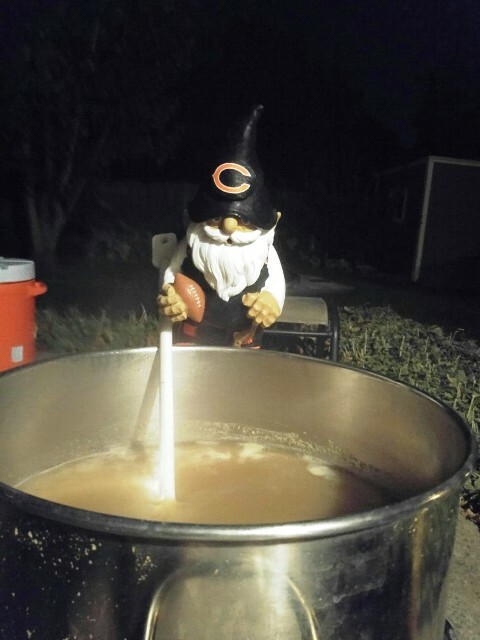 Then, I sparged Gnaughty, and started the boil. Sometime during Gnaughty's boil, I was able to pitch the yeast for Base Lovin'. The rest of the brew day went as usual. I didn't have time to rack Gnaughty before I left for church, so I let it sit with the pot covered while I did that. It was a pretty hot day, so the wort didn't cool any further when I was away. The ice bath was very necessary for Gnaughty. 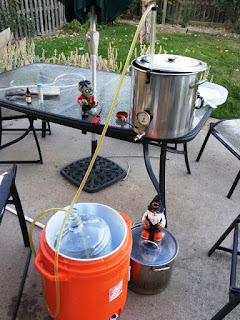 But, eventually, it cooled to where I wanted it, and I pitched the yeast. So, the brew day was a bit longer than usual, but it certainly didn't seem like twice as much. 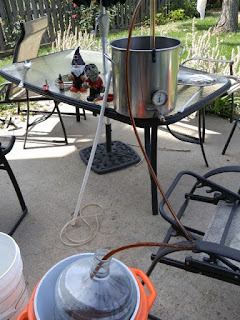 I wished that I had one more decent sized brew pot during this whole process, but all in all, the whole thing went pretty good. I'm not sure if I'll ever do a double brew-day again, but it is nice to know I have that option. If I do, it is more likely to be one big batch and one small batch instead of two medium sized batches. Now, I just need to wait. Base Lovin' American Wheat will be done first. I am not sure if I will add any straight to the keg of Apricot Lovin' American Wheat. Probably not. I'm not looking forward to the bottling process for either of these two batches. That is what I signed up for, though. The Bears lost to the Packers. That sucked, but since the Bears always lose to the Packers, at least I was not expecting anything different. I'll let you know how these beers turn out.